From Manhattan Bridge- - c.1915. Etching. Edition not stated. Signed and titled in pencil. 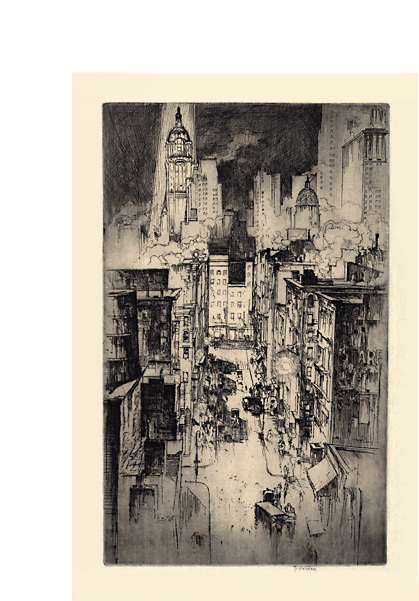 BROWN ROBERTSON CO PRINT PUBLISHERS NEW YORK blindstamp in the bottom right sheet corner. Image size 13 x 7 7/8 inches (330 x 200 mm); sheet size 16 9/16 x 10 1/4 inches (421 x 260 mm). 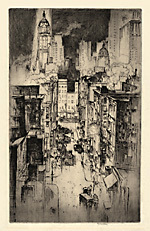 A superb impression with rich burr and selectively wiped plate tone, in warm black ink, on tissue thin cream Japan, with full margins (1 to 2 inches). 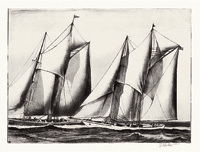 Overall time toning to the sheet; minor surface soiling in the margins, away from the image; pale mat line in the bottom margin; otherwise in good condition. .
Untitled (Yacht Race)- - c.1925. Etching with Aquatint. Image size 8 3/8 x 11 1/2 inches (213 x 292 mm); sheet size 9 7/8 x 13 1/4 inches (251 x 337 mm). 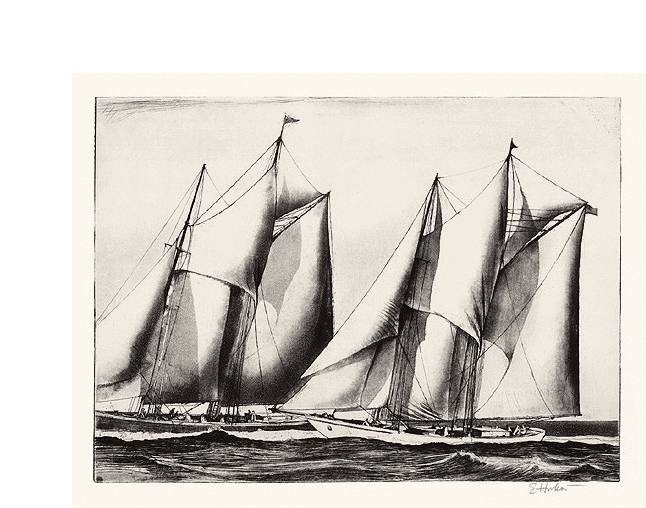 A rich, clean impression, on off-white wove paper, with margins (3/4 to 7/8 inch), in excellent condition. 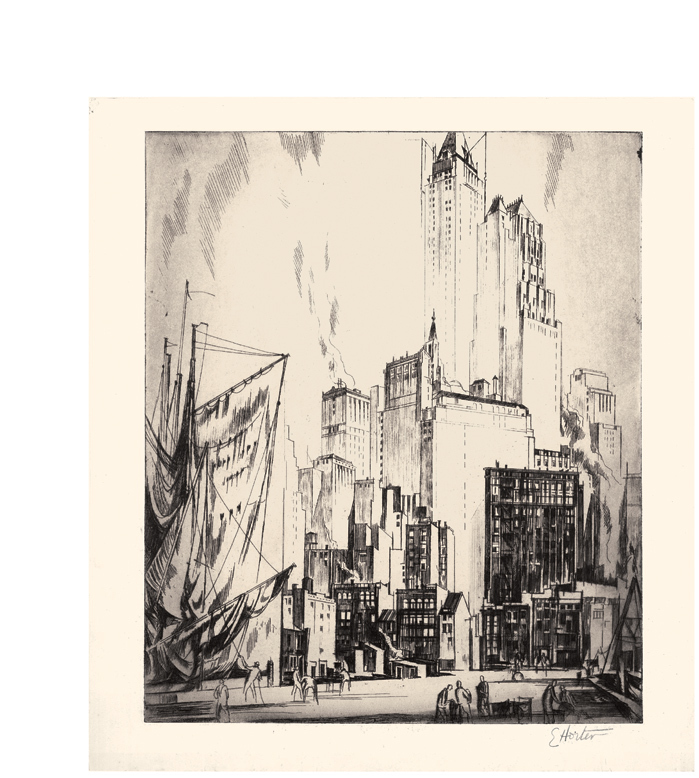 Untitled (The Woolworth Under Construction)- - c.1930. Etching. Image size 12 1/8 x 5 7/16 inches (308 x 136 mm); sheet size 14 1/2 x 7 1/4 inches (368 x 184 mm). 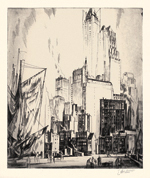 A fine impression, with selectively wiped platetone, on cream wove paper, with full margins (7/8 to 1 3/8 inches). Minor toning in the lower left margin (away from the image), otherwise in very good condition.